Agrarian or settled people “prepare” the environment and engineer consistent and bountiful harvests. It is not a coincidence that humankind experienced a population explosion shortly after making the transition from a nomadic to agrarian, settled existence around 8,000 B.C. Had we invested time and resources in developing faith communities over the last 50 years, then we would have also reaped the benefits of a vast UC population increase. Instead, thoughtful, quality people who wanted to take time to get to know our movement were often actually described as being “sent by Satan” to “waste” our time and distract us from finding “prepared people,” and were gotten rid of by being made to feel unwelcome. What we should have been doing was “preparing” people by investing in them, in one other and our community rather than losing patience if someone hadn’t consented to a seven-day workshop by the first month of contact. Fire, branches and even water are all biblical and UC metaphors, so I will illustrate the principle of community development to build a model of Cheon Il Guk with a brief description of fire-building. Apart from size and thickness, the main differentiating characteristics of these types of combustibles are flammability and burn duration. Kindling is thicker than tinder. Kindling cannot ignite from a spark but once heated up and dried sufficiently, it burns longer and is able to dry out and ignite the firewood. We can equate kindling to the friends and family we encouraged the “prepared” people to cut off from for fear of losing them, but actually lost the chance to connect with and establish friendship and family-based networks. Although both tinder and kindling cannot be relied on for a sustained fire, their value is they can multiply the energy from the initial spark and use their heat to sear away the moisture that renders firewood resistant to ignition. 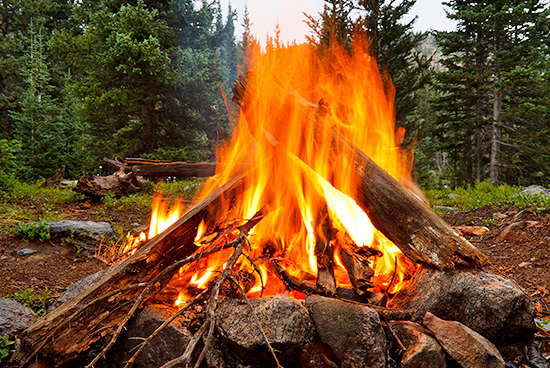 Firewood takes a long time to ignite, but once it does, it burns consistently hot and for a long duration; the tinder and kindling are no longer necessary to maintain the chain reaction. Firewood equates to the figures in society that needed much care and attention who would be great figures in God’s providence once they had been nurtured with sincere love and engagement. Encouraging “prepared people” to separate from their families and community after joining ensured failure as surely as a fire builder trying to burn logs would if he dispensed with the intermediary kindling and tried to ignite the logs through tinder only. Subject/object give and take action is at the core of our movement’s belief system, yet we rarely implement it in a principled way. Subject initiates and the object responds. The subject gives out energy (e.g., love) and the object returns beauty. The tragedy has been our failure to recognize that for this process to be sustainable, the subject has to be able to regenerate the depleted energy. The spent energy “cannot” be regenerated by the subject alone; the subject requires the returning beauty to stimulate the regeneration of this energy. “Returning beauty” is an equal and vital part of the process of give and take action and without it the process soon breaks down. A principled example would be members who took the subject position, initiated and gave out the energy of love — as evidenced by fundraising, labor and outreach to other communities — to bring about the existence of their very own church building. The church and activities made possible as a result are the returning beauty which gives the members of that community pride and joy, and though they gave of themselves, they do not feel empty but feel fulfilled and energized. An example of an “unprincipled” way would be the decades-long practice of soliciting donations for projects with no regard to ensuring that beauty would be returned; so, from the point of view of the member, the energy given disappeared into a seemingly insatiable providence. By this I do not mean “unworthy” projects but projects that are too vast, abstract or the fruits of success too distant for beauty to return in a reasonable timeframe. There is room for some level of pure sacrifice for such things but the ratio has to be sustainable. To bring Cheon Il Guk to the world, we must first become a model of it. To do this, we must be principled in both structure and function. Having reverence for God, True Parents and the lineage of True Family does not necessitate the abdication of free will, or limit free will only to choosing whether or not to blindly obey. Self-determination is essential in order for a local and national community to have pride in the fruits of their efforts — and this returning beauty is essential for the regeneration of desire. Abraham challenged God over the fate of Sodom and Gomorrah, perhaps not knowing if he would be struck dead for his temerity. Moses stood up to God over His intention to destroy the Israelites in the desert, and not only put his life on the line but his very salvation as he demanded that God “blot his name from the book of life” if he would not turn from his intention. I suggest that rather than being angry, God was thrilled and relieved to see the confidence of ownership displayed by these two great men. Establishing Cheon Il Guk can only happen when our community takes local and national ownership of ourselves, our goals, and also our relationship to God and True Parents. The strength of resistance of the eggshell is set so that only a chick strong enough to survive beyond its protective walls can break through. I strongly suspect that True Father created a controlling culture for the embryonic phase of our movement. Only when we are strong, confident and bold enough to live as a faith community of self-determination would we breakthrough (in a principled way) to a natural and principled level of independence. 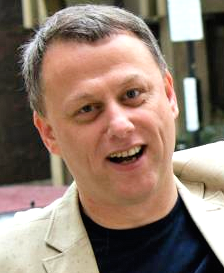 Peter Stephenson is the founder and CEO of a recent software startup, and has lived and worked for many years in the USA and in Korea, where he combined doing a church mission with writing for a national English language daily newspaper, The Korea Times. He currently lives in London. 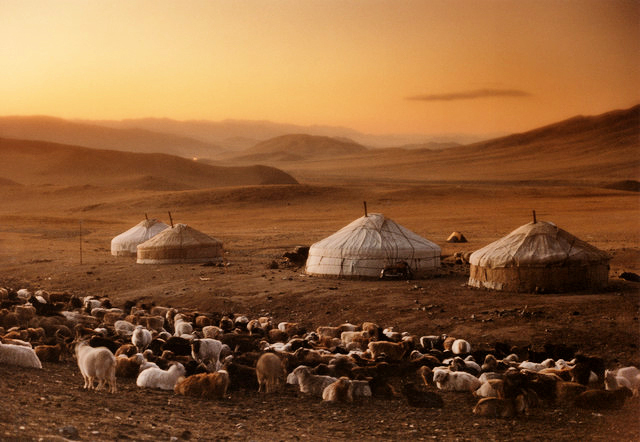 Photo at top: Yurts of nomadic sheep herders in Mongolia. ← The Freedom Society: Headwing Thought or Tea Party Politics? Great analogy and great analysis. Thank you. Well said, lad. Following directions over conscience and principles under threat of punishment was the essence of the fascist movements of the thirties. Christianity was moribund until Paul revived it with his evangelism centered on Jesus’ core message…yet half the New Testament is devoted to his letters mostly admonishing local churches for deviating from this. If we had a similar champion today, we’d be hearing the same chastisements. Reform was not a possibility with the early Christian church, because it demanded a sea change from the disciples (to whom Christians directed their obedience) that their states of mind simply couldn’t deliver. For the Christian movement not to sputter out like a fire in the rain took a much hotter, self-contained spark outside the mainstream called Saul who experienced his own sea change into Paul. I’d say he never reached any of the disciples. But he did reach the masses. His successful work made him the new core of Christianity and Jesus a household name. Today, we repeat that history…because it is a story of human nature. Christianity survived Jesus’ death to explode throughout the world because Paul championed a new model: individual conscience rooted in faithful adherence to Jesus’ core teaching of unconditional love. It ended slavery. Championed individual, God-given rights. Created democracy. Freed us from myth, candles and a flat, horse-drawn earth. And for one simple reason: Christianity has only one real reference point: individual conscience informed by unselfish love. As Jesus’ life was the model for Christians in how to make their conscience a viable reality in a post-Jesus world, so, too, should Father’s life and the True Parent idea be the model for how Unificationists make their conscience a viable reality in the world. In other words, we must take our freedom to connect directly with God through the model of Father’s and TP’s life to reach into the hearts of humanity and plant the seed, or strike the flame, of Divine Principle rooted in unconditional love. All else is just silly pontification with a predictable outcome. Excellent point, Peter. Thanks for making it. I agree, no or very little hope for a “forest fire” under the present circumstances. Where is God in the current Unification education and culture? God must be waiting, or maybe He is exploring other avenues. God would be in Unification Education if the curricula included His Original Plan for the Ideal of Creation – the original and perfect Blueprint in God’s mind before He created. Currently, it is being ignored, probably because we do not know it. It can be found in, and developed, from Rev. Moon’s teaching materials. UTS has the mission of saving America, per Father. It should be their main focus to find that plan and make it a core curriculum to save America. A more vertical approach over the horizontal mindset is called for. There is no goal. The central point is missing. There is one elegant model that can be taught as a guide to reach the goal. Very good analysis! True Father emphasized ownership over and over again – it got misunderstood and interpreted as to have possessions, positions and control. What he meant is just that – to qualify as tribal messiah you must develop ownership (oneness, fulfillment) of the three blessings. Recently, I read the book Ubuntu Contributianism: A Blueprint for Human Prosperity by Michael Tellinger, which encouraged me to actually go about building Cheon Il Guk. Bloom where you are planted = home church. What is fundamentally necessary to actually build a successful community is quite a lot. On average – without the supreme ideology of the Divine Principle and the tremendous support from three generations – 90 % of community-building ventures fail. I hope we will do much better in the near future, having that much spiritual and physical background and support. Good article and title that sums up the general situation in a nutshell. The Jordan River has not been crossed, therefore the church, such as it is, still needs leadership. Little noticed, but still true within the greater UC, the fact remains that self-governing entities that make up parts of the whole (UPF, IRFF, ACLC, et. al.) continue to break ground (or not) within their specialized realms. There have been some willing to take ownership and navigate the troubled waters. I have had the blessing of being involved with several of those people over the last 20 plus years out here in the “wilderness” that I live and raise a family. During the last year amazing things have been happening. That has come on the tremendous investments of many whose names and faces will never see the limelight. What is very clear is God is waiting on us, but most of the time we are waiting on God to help us take a “shortcut.” If we hang on to current organizations and structures why should we expect any different results than what we have experienced over our lifetime? The first thing we need to change is the only thing we truly have control over, ourselves. We have God, True Parents, God’s lineage, the Divine Principle, and all of history. What more do we need? Truth hurts, but it’s the only way to be set free. The situation is a reality as the article explains, the three-object purpose has been hindered at the leadership level; while Abraham and Moses challenged God, our dear local leadership is absolute — they don’t want any form of challenge let alone constructive criticism. I hope healing can start. Our nomadic phase, I believe, was supposed to end in the late 1970s and ’80s, when Father pushed us to do home church, and later, in the ’90s, when he specifically sent people out to our respective hometowns. Also around that time, he said the “church” era was over and this was the era of “families.” He strongly spoke about following one’s conscience, before leaders, teachers, parents, or even God, saying that if we are constantly referring to the inner sense of goodness, we would be holding ourselves to a deeper sense of responsibility than merely “obedience” or “unity” which were the watchwords for the earlier nomadic era. Finally, he gave us the authority and responsibility for Blessing others, authorizing us as tribal messiahs, in effect, saying that we have all the same value and burdens as the original TP have, thus that any of us could carry on the providence. I believe Father tried to provide a way to transition from the nomadic to the settled state, and further, guided us on how to become outward society changers, and to bring the Blessing culture to the larger world. The breakdown, I would say, happened because of the resistance of some of those who were considered “leaders.” They didn’t actually implement some of the directions given (home church, hometown, tribal messiah, etc.) so they never realized that the nomadic approach was no longer viable. In effect, we had a situation where they perceived their survival lay in ignoring the new directions. The dichotomy between what Father was urging — providentially and for our own development — and the mindset of “following church directions” has led to the current impasse. We have an aging, dying “old guard” who have not done many of the steps Father urged to move into the settlement situation. We also have an untapped braintrust of people who did transition into the autonomous, ownership mentality — but who don’t appear on the “official” radar. Two other issues: lack of attention to family and lineage, by creating a faulty sense that family was “personal” and mission was “public,” and the focus on spiritualism (a la CPL) added to the problem. Again, settlement means focusing on the family identity, and the value of each individual and each generation, and the development of the four realms of the heart. In other words, it fosters the building of an earthly heaven, in which the family is centered on God, practices Godly love towards each other, and then carries out that family-based love into the surrounding community. The spiritualism, by contrast, harkened back to the personal salvation ethic, and the idea of spiritual salvation, rather than physical/spiritual co-creatorship. The focus was on liberating the spirits of the dead, through ritual and sacrifice, and through pilgrimage and piety. Instead of being out in a community, as a family, working together with people of all faiths, the Blessed members left the family to attend spiritual events in isolation from their natural networks. Self-doubt, fear and shifting goalposts — combined with a highly contradictory demand that the person give large financial offerings while perhaps being unemployed, non-contributing and absent from the home community — created a preoccupied and disempowered population. Just at the time that we could have been applying our principles in a larger social setting, we became neo-nomads, running back to CPL to expiate the sins of our ancestors, rather than be effective social transformers in our own communities. I don’t feel this can be laid at the feet of Father. He gave us the tools, but we chose to use them or not. It is interesting that some leaders are now trying to rouse up members with tours and campaigns, much of which seems to focus on themselves. Virtually none of them are encouraging home church, tribal messiahship, following the conscience, or going beyond the development of “church” to the “world.” The biggest idea they can imagine is “witnessing” and that is based on the old nomadic concept, too. If we are not going to become a footnote in history, we are going to have to take on our own responsibility, not look to the church.